Testing for genetic diseases or traits is a rapidly developing practice, the most widely used form of testing currently in use being newborn screening. 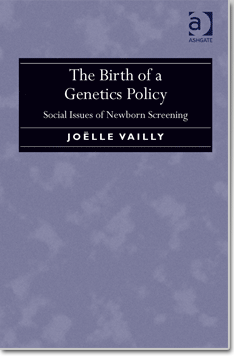 Based on a five-year research project and winner of the Prix ‘Le Monde’ for academic research in France, The Birth of a Genetics Policy analyses the three dimensions - scientific, political and moral - of the social issues raised by a policy of screening for the genetic disease of cystic fibrosis amongst babies. Drawing on extensive interview material and observational research, it explores the conditions under which a screening policy is decided upon and implemented, the types of political logic underlying it, and the effects it has on norms and values. Revealing the ties that exist between forms of biomedical knowledge and political techniques, whilst showing how the notion of biomedical abnormality is being extended, this book sheds light on judgements surrounding the idea of the ‘quality (of) life’. A rigorous examination of the discourses and practices of medical genetics in the early twenty-first century, The Birth of a Genetics Policy will appeal to sociologists and anthropologists with interests in medicine and the body, evidence-based care and questions of biopolitics and governmentality.